12.1: Anthony Hope Hawkins, author of The Prisoner of Zenda, was the son of the Revd Edwards Comerford Hawkins (1827-1906), of Saint Bride’s Church, Fleet Street, and through him was descended from the Comerford family of Wexford and Cork. According to John O’Hart, the Comerfords of Cork are said to be a branch of the Comerford family of Co Wexford. However, Joseph Comerford, merchant, of Cork, was a brother of Catherine Comerford who married James Nagle of Garranvilly or Garnavilla, near Cahir, Co Tipperary, serjeant-at-arms, Irish House of Commons, and brother of Sir Richard Nagle, Speaker of the Commons. Joseph Comerford of Cork was the same as Joseph Comerford of Anglure [see Chapter 6: Comerford of Ballymack and Callan], and was party to a family deed concerning a house and property in Clonmel. His brothers were Luke Comerford and John Comerford. Andrew Comerford, Garret Comerford, John Comerford and Peter Comerford of Cork, who died in the mid-18th century, may have been brothers. ANDREW COMERFORD married Dorcas Rice in 1729. GARRETT COMERFORD married Mary Pratt in 1737. Was she the Mary Comerford, widow, who married John Bradley in 1745? JOHN COMERFORD (ca 1688-ca 1769), of Cork. He was born ca 1688. In 1718, he married Elizabeth Edge (? died 20 October 1749). His will is dated 9 October 1766, and he died ca 1769 as probate was granted in 1769. Elizabeth may have died on 20 October 1749. He married secondly Bridget, daughter of Michael Kearney of Fethard, Co Tipperary, and his wife Elizabeth, daughter of Denis McCarthy of Spring House, Co Cork. 3, John Comerford (ca 1719-post 1769), of whom next. 5, James Comerford, living in 1769 and 1796. 6, Teresa, who conformed to the Church of Ireland in Rathconery Parish Church on 11 June 1769 and immediately after married ... Hamilton, a lieutenant in the 54th Regiment of Foot. 7, Anastasia, who in 1748 married George Hennessy of Ballymacoy, Co Cork. He was a brother of Elizabeth Hennessy who a year later married Anastasia’s brother, John Comerford (above), and of Richard Hennessy (1720-1800), founder of the Hennessy Cognac dynasty. JOHN COMERFORD (ca 1719-post 1770). He was a wine merchant in Cork in partnership with his son Patrick Comerford in 1769-1770, and was a senior partner in one of the 12 Cork firms prominent in the transatlantic trade from the 1730s to the 1770s. His sometime partner, Henry O’Shea, later owned 30 vessels that were based in Cork by the 1770s, and was part-owner of many more based in other ports. O’Shea developed quays and ship-repair facilities near his house downstream, and inter-continental trading interests. In 1749, he married Elizabeth Hennessy, daughter of James Hennessy of Ballymacoy (died 1770) and his wife Catherine Barrett. Elizabeth was a sister of George Hennessy who married John’s sister Anastasia (see above), and of Richard Hennessy (1720-1800), founder of the Hennessy Cognac dynasty. 1, Patrick Comerford, of whom next. 2, John Comerford (1761- ), of Cork, baptised on 24 April 1761 in South Parish (Saint Finbarre’s South), Cork. 3, James Comerford (1777- ) of Cork. He was baptised on 30 August 1777 in South Parish (Saint Finbarre’s South), Cork.. He was still living in 1796, when he was mentioned in the will of his brother, Patrick Comerford. He may have been the ancestor of the Comerford-Green family of Kinsale, Co Cork, and Blackrock, Co Dublin (see below). PATRICK COMERFORD (died 1796), merchant, of George’s Quay, Cork, and Summerville, Co Cork. He was a wine merchant in Cork in partnership with his father John Comerford in 1769-1770. He was one of the Roman Catholics called to the City Grand Jury in Cork in 1795. His will is dated 15 March 1796 and was granted probate on 16 September 1796. He married in Bath on 20 August 1770 Anne, or Teresa, daughter of Thomas Gleadowe (1700-1766) of Castle Street, Dublin, and his wife Teresa (Workman), and a sister of Sir William Gleadowe-Newcomen (1730-1806), the banker, of Killester, Co Dublin. ●● 1b, Marie (1832-1917). She was born in July 1832, and died in Biarritz on 3 January 1917; in 1868, she married Henri O’Shea (1836-1905). ●●3b, Berthe (1838-1893). She was born in Paris 19 July 1838, and died in October 1893. In 1861, she married Auguste Guillemin (1813-1877). ●● 4b, Jean Gaston Lannes de Montebello (1840-1926), born 16 May 1840 in Pau; died on 22 December 1926 in Pau. ●●● 4c, Hedwige Marie Renée (1881-1944). She was born in Pau on 10 Mar 1881, and died in the concentration camp in Ravensbrück on 19 Nov 1944. On 17 September 1910, she married in Biarritz Louis d’Ax dit de Vaudricourt (Château Vaudricourt). He was born on 20 May 1879 and died in the concentration camp in Dachau on January 1945. Her brother, brother, Count André Roger Lannes de Montebello (1908-1986), was involved in the French resistance during World War II and was the father of Count Guy Philippe Henri Lannes de Montebello, who, as Philippe de Montebello, who was director of the Meetroplitan Museum of Art, New York, until 2008. ●● 6b, Roger Gaston Lannes de Montebello (1850-1878). He was born in 1850, and died in Paris on 28 June 1878. ● 3a, Harriet Boddington (1809-1877). 2, Belinda Isabella, who married on 5 November 1795 the Revd Francis Law, BA (1768-1807), and of whom next. 2, Elizabeth, who married Thomas Roberts. 3, (The Revd) Patrick Comerford Law (1797-1869), of whom next. ● 1a, Isabella Barbara (1841-1891), born at Rutland Square, Dublin, 26 February 1841. She married at Saint James’s, Paddington, London, on 6 September 1875, (Major-General) George Baret Stokes of the Royal Inniskilling Fusiliers and Mounthawk, Tralee, Co Kerry. She died at The Priory, Slapton, South Devon, on 9 July 1891, and is buried in Slapton. 5, (The Revd) Francis Law (1800-1881), of whom after his eldest brother, the Revd Patrick Comerford Law. 6, Isabella (1802-1802). She was born 28 January 1802, and died 22 September 1802. 7, Samuel Law (1803-1804). He was born on 20 June 1803, and died in infancy. 8, Hugh Law (1807-1807), born 20 May 1807, baptised privately the same day, and died 28 May 1807. (The Revd) Patrick Comerford Law (1797-1869), of Summerville, Co Cork, and Ballyalley, Killaloe, Co Clare. He was born in Tenby, Pembrokeshire, on 21 August 1797. He was was educated at Trinity College Dublin (BA, 1818), and first practised at the Irish Bar. He was ordained deacon 1828, priest 1829, and was an army chaplain in Birr, King’s County (Offaly), Rector of Samlesbury, Lancashire (1829), Rector of North Repps, Norfolk (1830-1869), Rural Dean (1842), and chaplain to the Marquis of Cholmondeley. 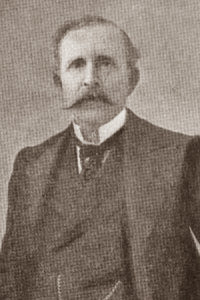 His second cousin, Michael Law, was the father of Sir Edward Fitzgerald Law (1846-1908), of Athens, who was involved in reforming the Greek economy in the 1890s and in the negotiations leading to the eventual restoration of Crete to the Greek state; he married Catherine Hatsopoulo, of an old Byzantine family who had settled in Athens, and he is buried in the First Cemetery, Athens. 1, Georgiana Anne (1829-1895), born at Samlesbury 19 August 1829, baptised there 18 September 1829. She married at Saint Mark’s, Notting Hill, London, on 22 January 1870, the Revd Theophilus John Fenton (1827-1902) of Hawthorn Cottage, Gobowen, Oswestry, Shropshire, son of the Revd Samuel Fenton (1797-1800), Vicar of Fishguard, Pembrokeshire, and later Rector of Saint Mary’s, Wavertree, near Liverpool. Her husband was educated at Magdalen Hall, Oxford (BA and MA 1860), and was the curate of Awre in the Diocese of Derby (1867); curate, North Repps (1868-1869), where he met his wife; curate of Christ Church, Stranton, Hartlepool (1871); curate, Cottesmore, Rutland (dates unknown); living in Llangollen without a parish in 1881; and curate of Bramshall, near Uttoxeter, Staffordshire, in the Diocese of Lichfield (1882-1894). She died at Gobowen on 7 March 1895, and was buried a week later at Bramshall on 14 March 1895. He was living at Seabank Road, Liscard, Cheshire, when he died on 30 May 1902. 2, Francis Patrick Law (1830-1832), born at North Repps Rectory on 1 October 1830, and baptised at North Repps on 30 October 1830. He died at North Repps on 29 March 1832, and was buried there on 31 March 1832. 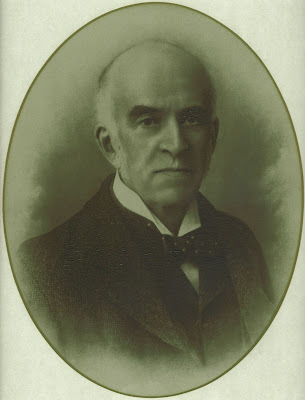 3, Alexander Patrick Law (1832-1895), born at North Repps Rectory on 14 January 1832, baptised at North Repps 14 May 1832, He was educated at Rugby and Corpus Christi College, Oxford (BA, MA 1860). He was known in the cricketing world as ‘AP Infelix.’ He died at Kew, Surrey, on 30 October 1895, and was buried in Norwood Cemetery. 4, Frances (‘Fanny’) Amelia Law (1833-1883). She was born at North Repps Rectory on 1 April 1833, and baptised at North Repps on 6 May 1833. She married at North Repps on 14 August 1862, Henry Charles Hull (1833-1902), barrister, son of the Revd Henry William Hull of Exmouth, Devon, and his wife Maria Charlotte (Phillipps). She died at 55 Argyll Road, Kensington, London, on 5 October 1883, and was buried in Brompton Cemetery, London, on 11 October 1883. Their daughter, Agnes Georgina Hull (1868-1936), had a special friendship with the Revd Charles L Dodgson (‘Lewis Carroll’), author of Alice in Wonderland, who got to know the Hull family while they were living in Eastbourne in 1877. 5, Isabella Susan (1835-1885). She was born at North Repps Rectory, Norfolk, on 27 February 1835, and was baptised at North Repps on 2 April 1835; she died unmarried at Norwood, Surrey, on 14 January 1885 and was buried at Elmer’s End Cemetery, Kent. 6, Patrick Francis Law (1836-1909). Born at North Repps Rectory on 28 August 1836, and baptised on 18 September 1836. He was educated at Rugby and was a clerk at the War Office. Both Patrick and his brother Alexander played cricket, and Patrick played for Rugby School (1854-1855), Gentlemen of Norfolk (1855-1868), Civil Service (1864), CL Bell’s Civil Service XI (1866), Marylebone Cricket Club (1866-1872), and Gentlemen of Warwickshire (1871). 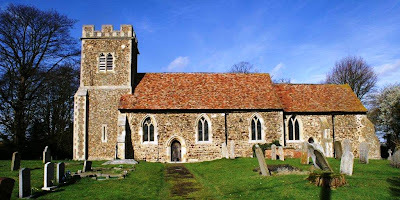 He married in Walsingham on 9 July 1868 Julia, second daughter of Henry Taylor Jones of Chatham and Hoo, Kent, and his wife, Caroline, Dowager Lady Hardinge, who was first married to Sir Richard Hardinge of Belleisle, Co Fermanagh. Their wedding was conducted by his brother, the Revd Robert Arbuthnot Law (see below), and the Revd James Lee Warner. 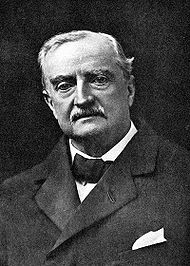 They lived at 52 Cambridge Street, Hyde Park, London; he died on 3 December 1909 in Shurdington, Gloucestershire; Patrick and Julia were the parents of three sons: Arthur Fitzpatrick Law (1870-1870), died in infancy; (Captain) Cecil Arbuthnot Law (1872-1932), who married Mary Theresa Forestier Walker on 29 April 1902 in Mussoorie, Bengal, and died in Menone, France; and (Colonel) Walter Henry Patrick Law, DSO (1876-1956), educated Charterhouse and Oriel College Oxford, who married Dorothy, daughter of Sir John Arthur Brooke. 8, Arthur Arbuthnot Law (1840-1841), born at North Repps Rectory 30 May 1840, baptised 13 August 1840. He died at North Repps Rectory on 24 February 1841. 9, (The Revd) Robert Arbuthnot Law (1842-1889). He was born at North Repps Rectory 28 February 1842 and baptised at North Repps 15 May 1842. He was educated at Rugby and Trinity College, Cambridge. he was Curate of All Saints’, Hertford (1866-1869), Rector of Larling, Norfolk (1870-1875), and of Gunthorpe with Bale, Norfolk (1875-1889). He married Agnes (1834-1882), only daughter of the Revd Chancellor John Henry Sparke of Gunthorpe Hall, and his wife Agnes, daughter of Sir Jacob Henry Astley. They were married at All Souls’, Langham Place on 20 January 1870 by her uncle, Canon Edward Bowyer Sparke. Robert died at Gunnersbury Lodge, Acton, Middlesex, 11 December 1889 and was buried at Gunthorpe; Agnes died at Burgh Hall, Melton Constable, Norfolk, on 18 June 1892. 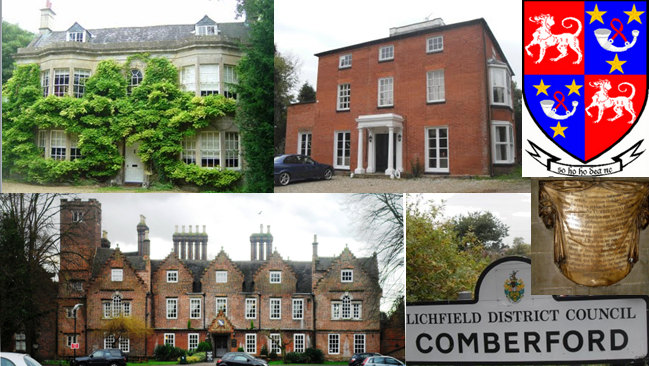 They were the parents of three sons: Arbuthnot Patrick Astley Law (1872-1938), educated Rugby, of Chesterton, Cambridge; Hubert Henry Bingham Law (1873-1936), educated Radley, died unmarried; Alexander Delaval Hamilton Law (1874-1938), educated Eton and Trinity Hall, Cambridge, a racehorse trainer at Nepcote Lodge, Findon, Sussex. ● 1a, Hamilton Patrick John Holland Law (1879-1960), singer. He was born in 1879 and educated at Clare College Cambridge. He married on 9 October 1907 Frances Dora (1887-1973), only daughter of the Revd Cecil Brereton (1856-1939), Rector of Hardham. He died in Bournemouth 7 April 1960 and she died n Bournemouth 18 March 1973. ● 1a, Francis Arthur Law (1867- ), born at Newfane, Niagara Co, 1 June 1867, baptised at Grace Church, Lockport City, New York, in July 1867. He married at Saginaw, Michigan, on 20 February 1897, Rose Anne Livingston. ● 2a, Ruth Ellen (1868- ), born at Wilson, Niagara County, 22 May 1868, baptised at Grace Church, Lockport City. She married at Tittabawasse, Saginaw, on 28 November 1889, George Egerton Metcalf. ● 3a, William Henry Law (1869-1876), born at Wilson, Niagara, 20 September 1869, baptised at Lockport City. He died on 4 November 1876 at Tittabawasse, Saginaw, Michigan. ● 4a, William Henry Law (1869-1876), born at Wilson, Niagara, 20 September 1869, baptised at Lockport City. He died on 4 November 1876 at Tittabawasse, Saginaw, Michigan. ● 5a Minnie Louisa (1872-1897), born at Tittabawasse, Saginaw, 9 May 1872, died at Freeland, Saginaw, 22 October 1897. ● 6a, Florence Marianne (1874- ), born at Tittabawasse, Saginaw, 4 November 1874. ● 7a, Robert Archie Law (1877-1923), born at Tittabawassee (Freeland), 18 November 1877. He married Nella Maud Thomson (1878-1962). He died in 1923. Their seven children were: Robert Dale Law, lawyer, of Grand Rapids, Michigan, who died in Toledo following a heart attack during his son-in-law’s sermon; Francis Warner Law; Bertha Emily; Marion (grandmother of Lauri Wagaman), who died on 28 December 1973; Virginia Ruth; Don Carlos Law; and Dan Delton Law. 2, Peter Comerford, of whom next. 1, Jane, of whom next. 1, Peter Comerford of Bachelor’s Quay, Cork, recorded in Pigot’s Directory of Cork City in 1824, and who voted in the 1829 election. JANE COMERFORD (above) who in 1792 married her cousin Edwards Casey of Cahirgal and Elmgrove, Cork. The Comerford name was continued through their descendants. Edwards Casey died in 1827. 1, (Dr) Thomas Casey, of whom next. 2, William Comerford Casey ( -1852), of whom after Thomas. 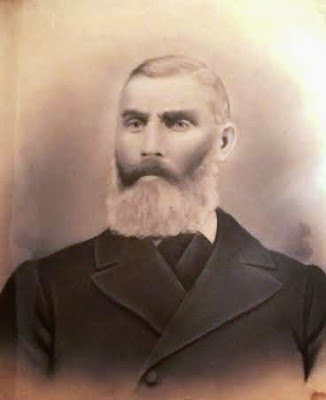 3, George Casey ( -1879), of whom after William. ● 1a, Mary Jane, who died in England in 1884. ● 1a, Hannah, who married the Ven Samuel Cheetham (1827-1908), Professor of Pastoral Theology, King’s College, London, and later Archdeacon of Rochester. They had no children. ●● 1b, (The Revd Canon) Francis Henry Albert Hawkins (1855-1940), Rector of All Saints’, Highgate, and Prebendary of Saint Paul’s Cathedral London, who was the father of the Revd Canon Robert Henry Hawkins, MA (1892-1989), Vicar of Saint Mary’s, Nottingham (1943-1958), and a Canon of Saint George’s Chapel, Windsor, from 1958. ●● 2b, (Dr) Edward Hawkins. ●● 3b, Henrietta, who worked with her father at Colney Hatch. ●● 4b, (Sister) Mary, an Anglican nun. 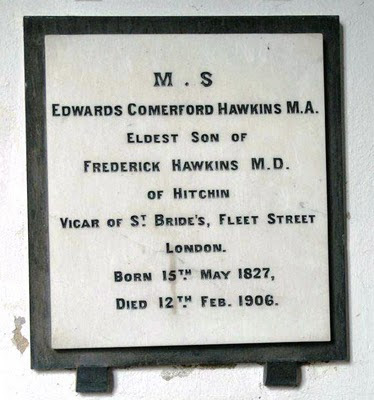 ● 3a, (The Revd) Edwards Comerford Hawkins (1827-1906), Anglican priest, teacher and author. He was born on 15 May 1827. He was educated at Exeter College, Oxford (BA, 1849). He was headmaster of Saint John’s Foundation School for the Sons of Poor Clergy (1861-1883), and Vicar of Saint Bride’s, Fleet Street, London (1883-1904). He was the author of Spirit and Form (1881), and The Church and Parish of St Bride, Fleet Street (1883). He died on 12 February 1906, and is buried in Saint Margaret’s Church, Higham Gobion. He was also commemorated with an inscribed tablet of white marble,which once was on the ground floor of the tower at Saint Bride’s, and is now  in the crypt. formerly Head Master of St John’s School, Leatherhead. Born 15th May 1827. Died 12th Feb. 1906. The Scripture reference is I John 2: 10. ●● 1b, Geoffrey Hawkins, Parliamentary Solicitor. 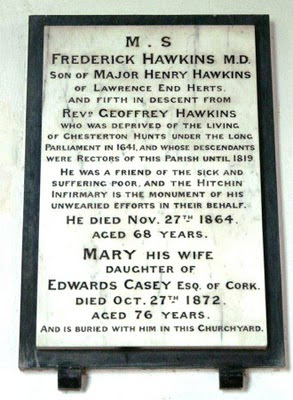 12.7: Anthony Hope Hawkins (1863-1933), author of The Prisoner of Zenda, was the son of the Revd Edwards Comerford Hawkins (1827-1906), of Saint Bride’s Church, Fleet Street, and through him was descended from the Comerford family of Wexford and Cork. ●● 2b, (Sir) Anthony Hope Hawkins (1863-1933). He was born on 9 February 1863 in Clapton House, London. He was educated at his father’s school, Clapton, Marlborough, Balliol College, Oxford, and the Middle Temple. He was President of the Oxford Union (1886). He was called to the bar in 1887 and practised from the same chambers as H.H. Asquith, the future prime minister. He was defeated as the Liberal candidate for South Buckinghamshire, 1892. 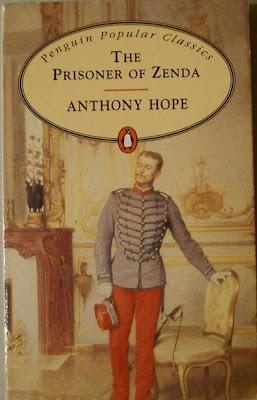 As Anthony Hope, he was the author of the Ruritania novels, including The Prisoner of Zenda, The Heart of Princess Osra, and Rupert of Henzau. Through his mother he was a first cousin of Kenneth Grahame, author of The Wind in the Willows. He married in 1903 Elizabeth Somerville Sheldon (died 1946) of New York, and they had two sons and a daughter. They lived at 41 Bedford Square, London, and then at Heath Farm, Walton on the Hill, Surrey, and Gower Street, London. He died on 8 July 1933, and is buried in Leatherhead. ●● 3b, Joan, married Ernest Feilin, and had children. 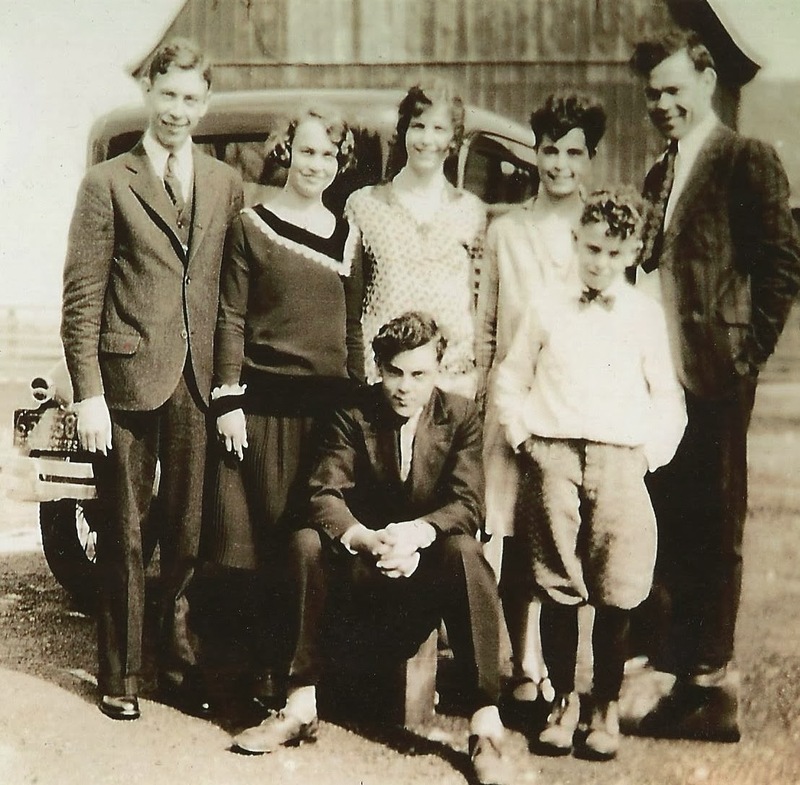 ● 4a, Ernest Hawkins, married Mary Cator and had five sons and three daughters. ● 5a, Albert Hawkins, a surgeon in the British army during the Crimean and Chinese wars, he died without having children. 1, (Dr) Edward Casey, MD (ca 1833-1917), of Windsor, Berkshire. Educated King’s College London (BSc, The Lancet, 15 December 1866). Practising medicine in Ewer by 1870 (Reading Mercury, 24 September 1870). Appointed Medical Officer of Health, Windsor, 13 December 1882 (Berkshire Records Office WI/AS1/4; New Windsor Local Board of Health Minute Book 6). He died at his home, 3 Park Street, Windsor, on Sunday 30 December 1917 aged 74 (Slough, Eton & Windsor Observer, 05/01/1918, p. 2; email correspondence with Peter Steere of Kellogg College, Oxford, 7 and 8/10/2014). 2, (The Revd) Henry Ernest Casey (1840-1923). He was born in St Alban’s, Hertfordshire, in April 1840, and was baptised on 22 May 1842. He was educated at Uppingham and was admitted a sizar at Saint John’s College, Cambridge, on 7 July 1858 (BA, 1862, MA, 1867). 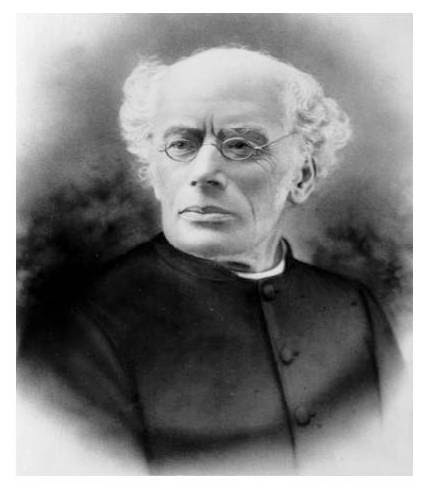 He was Assistant Master at Rossall School (1862-1863) before being ordained deacon (1864) and priest (1866) by Samuel Wilberforce, Bishop of Oxford. He was curate of Slough, Buckinghamshire (1864-1867), curate of Braceborough, Lincolnshire (1867-1870), curate of Saint John’s Bedwardine, Worcestershire (1871-1879); and Vicar of Berrow, Ledbury, Worcestershire (1879-1916). In retirement, he lived in Malvern Link, Worcestershire, and died there on 16 August 1923, aged 83. 3, Anne Louisa, died young. 4, Mary (died 1872), married the Revd Jonathan Henry Bennett, MA (1829-1896), of Corpus Christi College, Cambridge, and Headmaster of Falmouth Grammar School (1856-1888). ● 1a, Mabel Healy, graduated at Wells College 1895. ● 2a, Norah Florence, graduated at Wells College 1897. 2, Edward Casey ( -ca 1890), a solicitor, of Basing Lodge, Hitchin. 3, Mary, born in Liverpool in 1845, baptised in Holy Trinity Church, Wavertree, 25 April 1845. She married in 1870 her cousin, Major Henry Wallich Maclear (1845-1911) of the 3rd Buffs and they had five sons. 4, Frederick Casey (1847-1887). He was born on 2 January 1847, and was baptised on 2 August 1848 in Holy Trinity Church, Wavertree. He died in 1887 at the Grande Saline, Haiti, West Indies. 5, Susanna Baretta (1848- ). She was born on 25 July 1848, and was baptised on 20 August 1848 in Holy Trinity Church, Wavertree. 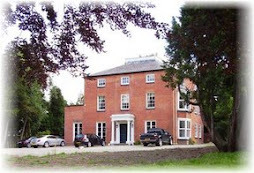 She was living at 69 Sandown Lane, Wavertree, when she married on 7 July 1885 in Saint Bridget’s Church, Wavertree, Thomas Moore, widowed, bank cashier, of 63 Newsham Drive, Walton, Liverpool, son of Dr Alexander Moore. The witnesses were her brother Horace Comerford Moore and her cousin, Rachel Eade, who later married Horace. It is interesting to note how the marriage records indicate the way in which the family maintained its connections with Ireland: the marriage licence was issued by the Revd Canon Courtenay Moore, Rector of Mitchelstown, Co Cork. 6, Horace Comerford Casey (1850-1920). He was born on 7 June 1850, and baptised on 14 July 1850 in Holy Trinity Church, Wavertree. He died aged 69 in Farnham, Surrey, in June 1920. In 1891, he married his cousin, Rachel Eade (1854-1942), daughter of Joseph Eade (1820-1862) of Richmond, Surrey, and his wife Rachel Hawkins (1824-1919) of Hitchin, Hertfordshire. Horace and Rachel Comerford Casey had no children. ● 1a, Guy Duranty (1884- ), baptised on 13 November 1884, in Saint Bridget's Church, Wavertree. ● 1a, Charles Hale, born 1879; educated at Eton, Lieutenant, 7th Battalion Rifle Brigade. ● 5a, Sibyl Rose d’Amour, married in 1898, Charles Alexander F. Duranty, and had children. 1, (The Revd) George Edwards Comerford-Casey (1846-1912), of whom next. 2, Charles Ash Wyndham Casey, who died in infancy. 3, Comerford Glenny Casey, who died in infancy. 4, (Major) Charles Leslie Casey of the Royal Artillery, member of the Naval and Military Club, Piccadilly, London. 5, Arthur Edwin Comerford-Casey, of the Bengal Civil Service, and 16 St James’s Square, London. He was educated at Portora Royal School, Enniskillen, and Marlborough College, Wiltshire. He was appointed to the Bengal Civil Service in 1872, and arrived in India in 1874. He served in the North-West Province and retired October 1889. He married on 2 June 1885 Edith A. (died 1886 at Suez, Egypt), daughter of General Sir Thomas Willshire, Baronet, GCB (1789-1862), who was made a baronet in 1841 for his part in the campaign in Afghanistan, at the siege of Ghuznee and at the capture of Khelat. Arthur Edwin Comerford-Casey was granted a coat-of-arms for himself and the descendants of his grandparents, Edwards Casey and Jane Comerford, incorporating elements of both the Casey and Comerford coats of arms. 1, Isabel (died in England in 1887), married Lieutenant Francis Ross Bromilow, RN, of Fraserburgh (died 17 September 1880), and had children. 2, Helena Mary, died in 1882 at Ranibagh, North-West Province, India (present-day Pakistan). 1, Olive Bourcicault Comerford, born in 1875, living 1913. 2, Alvina Bertram (‘Bertie’) Comerford, born in 1877, living 1913. 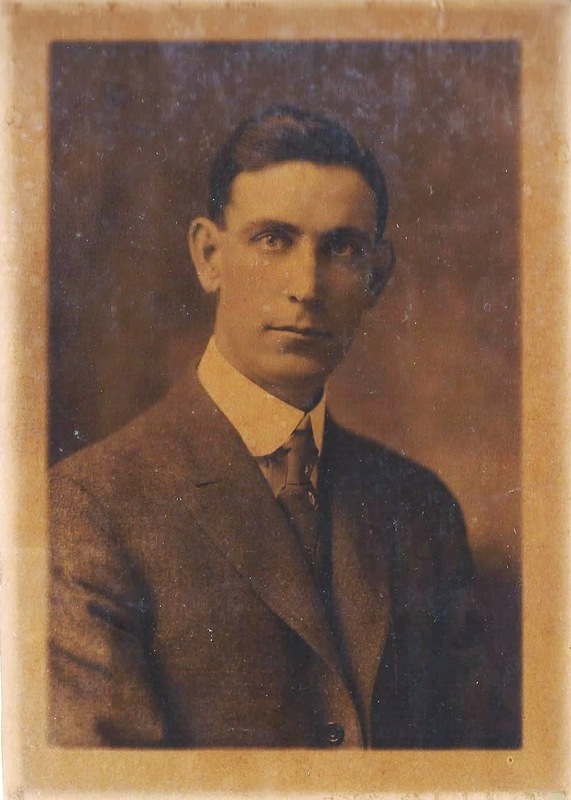 3, Edward Comerford Casey, born in 1880, living in 1888. 1, George Comerford, 57th Regiment, who died unmarried. 2, (Captain) James Comerford, of whom next. 1, Anna, born 1829, of whom next. 2, Thomas Comerford (1829- ), born in December 1829, baptised in Kinsale 29 December 1829 (sponsors, Thomas Rochford, Ann Vicars). 3, Marcella, born July 1836, baptised in Kinsale on 11 July 1836. John James Comerford (1839- ), born September 1839, baptised in Kinsale 11 September 1839. 1, Mary Marcella Elizabeth (1858-1909), born 8 August 1858, baptised Saint Mary’s Pro-Cathedral, 15 August 1858 (sponsors Joseph Maxwell, Mary Weldon). She died unmarried in 1909. 2, Thomas Sullivan Greene, JP, BA (TCD) (1860-1925). He was born on 27 January 1860 at Air Hill, Co Cork, and baptised on 21 February 1860 in Saint Mary’s Pro-Cathedral, Dublin (sponsors: Patrick Maxwell, Marcella Comerford). He was appointed an Assistant Land Commissioner in 1899. He died in 1925. 2, (Lieutenant-Colonel) James Sullivan Comerford Green, BA (TCD) (1861-1927). He was born in 1861, and baptised in Saint Mary’s Pro-Cathedral, Dublin (sponsors: James Maxwell and Amelia Maxwell). He was educated at Trinity College Dublin (BA), and was a surgeon-captain in the Royal Army Medical Corps. he served with the Manipore Expedition in 1891 (meddal with clasp), and the Burmese Expedition, 1891-1892, including the operations of the Irrawaddy Column (clasp). He took part in the South African War (1899-1902), including the defence of Ladysmith (medal with five clasps, King’s Medal with clasp). He died in 1927. 3, George Comerford Green, BA (TCD), barrister-at-law, born in 1863, of whom next. ● 1a, James Sullivan Green. He married on 4 July 1944 Dorothy M. Clarke, and they have a son and two daughters: John Redmond Denis Green (born ca 1949; (Dr) Mary Cecilia Dorothy Green (born ca 1954), MB, BCh, Fellow, the Royal College of Psychiatrists; and Esther Mary Green, who married (Dr) Thomas Power, of Belle-Harbour, New York. ● 2a, John Redmond Green. He married ca on 12 January 1942 Eileen Ahern and they have a daughter: Barbara, who married (Lieutenant-Commander) David Lockyer, and they have a son and a daughter, Penelope Lockyer (born ca 1973), and Charles Lockyer (born ca 1975). 5, Anne (Anna Susan Frances) (1865-1909), born on 4 November 1865, and baptised on 16 November 1865 in Saint Mary’s Pro-Cathedral, Dublin (sponsors: John Weldon, Anna Maxwell). She died unmarried in 1909. 6, Marcella Mary Ursula (1867-1909), born on 14 May 1867, and baptised in Saint Mary’s Pro-Cathedral, Dublin on 26 May 1867 (sponsors: Thomas M Reilly, Anne Goold). 7, Suzanne (Susan) Mary, born in 1870, and baptised in Saint Andrew’s Church, Westland Row, Dublin (sponsors: Richard Power and Mary Power). (His Hon Judge) GEORGE COMERFORD-GREEN (1863- ), KC, BA (TCD), barrister-at-law, judge. He was born 19 January 1863, and baptised Saint Mary’s Pro-Cathedral 2 February 1863 (sponsors Joseph Maxwell, Eliza Green). He lived at 83 Lower Leeson Street, and later at Herberton, 12 Cross Avenue, Blackrock, Co Dublin. At that time, Eamon de Valera and his family lived at No 15, and Kevin O’Higgins was assassinated on Cross Avenue. Comerford-Green was called to the bar in 1886. By 1907, he was Professor of English Law at Queen’s College, Cork. Ca 1916-1924, he was a county court judge, and chairman of the Quarter Sessions for Co Armagh and Co Louth. By 1935, he was county court judge and Chairman of the Quarter Sessions, Co Armagh and Co Fermanagh. 1, James Reginald Comerford-Green, born 1912, of whom next. 2, (Colonel) Kenelm George Comerford-Green, of whom after James. 1, (Sister) Carolyn Green, SHCJ, a nun in the Society of the Holy Child Jesus, co-author with Sister Pauline Darby, SHCJ, and Sister Anne Stewart, SHCJ, of One Woman’s Journey in Faith (Rome: SHCJ Publications, 1990). She died in Oxford on 18 February 2012, and is buried in Wolvercote Cemetery, Oxford. 2, Michael Green (living 2012), a partner in Maxwells Solicitors, Herbert Place, Dublin, for over 30 years, specialising in Land and Tenant law, commercial conveyancing and charity law. He advises a number of large religious orders on property and trust law with particular reference to the field of education at primary, secondary and third level. 3, Francesca (Fenwick) (living 2012). 4, Kenelm (‘Kensey’) Green, banker (living 2012). 5, John Green (living 2012). (Colonel) KENELM GEORGE (‘Kensey’) COMERFORD-GREEN, CBE (1915-2003). He was born in 1915, and was educated at Stonyhurst and the Royal Military College, Sandhurst. During World War II, he was in France, Belgium, North Africa, Sicily and Italy, and was mentioned in despatches. He was colonel of the Duke of Edinburgh’s Royal Regiment, then commanded the 2nd Battalion, the Wiltshire Regiment (1946-1947), military assistant to the commanders-in-chief of the British Army on the Rhine (BAOR) and Far East Land Forces (1949-1951), Assistant Secretary to the Standing Group, NATO, Washington (1955-1957), Commandant, Far East Training Centre, Singapore (1958-1960), 1st Grade Staff Officer Operations SHAPE Paris (1961-1962), Chief of Staff to CGS Malaysia (1963-1965), Assistant Adjutant-General, British Ministry of Defence 1966-1969, and then Assistant Director of Personal Services. He was made a CBE (Mil) 1966. He was a member of the United Services and Royal Irish Yacht Clubs. He died at Saint Teresa’s Home, Wimbledon, on 8 July 2003. B. O’Connell, KM, FRIGS, “The Nagles of Garnavilla,” The Irish Genealogist, vol 3, No 1 (July 1956, pp. 17-24), p 17. HW Gillman, Index to the Marriage Licence Bonds of the Diocese of Cork and Ross, Ireland (1623-1750) (Cork, 1896-1897), p. 29. Betham 1/3, f 87, n 271. Betham 1/3, f 87, n 271, although Betham’s manuscript is difficult to read on this reference. (Col) J.G. White, “Historical and Topographical Notes &c.,” in Buttevant, Castletownroche, Doneraile, Mallow (Cork: Guy, 1905), vol 1, 412 pp, pp 251-254; Burke’s Landed Gentry of Ireland, 1846, with additions. Cork Evening Post, 12 June 1769, Faulkner’s Dublin Journal, 15-17 June 1769, cited in AR Chamney, “Catholic converts recorded in some 18th century Irish newspapers,” The Irish Genealogist, vol 11, no 1, 2002, p. 34. Gillman (p. 29) gives her name as Anstace. (Revd) Wallace Clare, “A brief directory of the city of Cork, 1769-1770,” The Irish Genealogist (1), p. 256; David Dickson, Old World Colony, Cork and South Munster 1630-1830 (Cork: Cork University Press, 2005), p. 168. TGH Green, Index to the Marriage Licence Bonds of the Diocese of Cloyne, Ireland (1630-1800), (Cork, 1899-1900), p. 25. Betham 1/13, f 87, n 271. Betham 1/15, f 63, n 180. R. Lucas, The Cork (City) Directory for the Year 1787 (http://www.corkancestors.com/1787CorkDirectory.htm); Wallace Clare, p. 256; Dickson (2005), p. 461. Betham 1/3, ff 63-64, n 180. For more on Mary (Comerford) Boddington, see also DJ O’Donoghue, The Poets of Ireland, a biographical and bibliographical dictionary of Irish writers of English verse (Dublin: Hodges Figgis, Oxford: Oxford University Press, 1912 ); Lee O’Brien, ‘Reading/Writing the Forgotten: The Poetry of Mary Boddington,’ Victorian Poetry, Volume 41, Number 4, Winter 2003, pp 473-481. Burke’s Landed Gentry of Ireland (1912), s.v. Law of Killaloe; Burke’s Landed Gentry of Ireland (1958), s.v. Law of Rosnaree, pp 426-428; Wallace, s.v. Patrick Law and Arthur Wynne; Burke’s Irish Family Records (London: Burke’s Peerage, 1976), s.v. Law. Burke’s Landed Gentry of Ireland (1958), s.v. Law of Rosnaree, pp 426-428; Wallace, s.v. 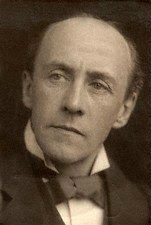 Arthur Wynne. Betham 1/3, ff 63-64, n 180. Hibernian Chronicle, 20 August 1770, cited on http://www.corkancestors.com/Deathsmarriages.htm . Phillimore, Index 2, Cork and Ross Wills, p. 24. Green, p. 30; O’Hart 2, p. 535. Crockford’s (1887), p. 555; Crockford’s (1903), p. 619; Oxford Dictionary of National Biography, vol 25, pp 906-907; O’Hart 2, p. 535. Oxford Dictionary of National Biography, vol 25, pp 906-907.
 http://www.corkancestors.com/1829corkelection.htm; Crockford’s (1903), p. 232; O’Hart 2, pp 535-537.
 http://www.corkancestors.com/1829corkelection.htm; Burke’s Landed Gentry, various eds, s.v. Hale; Crockford’s (1887), p. 211; O’Hart 2, p. 536; http://www.users.bigpond.com/nebula72/tree/gp30.html#head2. Burke’s Peerage, various editions, s.v. Willlshire (1841); O’Hart 2, pp 532-533, 536. Burke’s Peerage, various editions, s.v. Eardley-Wilmot. Crockford’s (1887), p. 260; O’Hart 2, pp 536-537; R. Desmond, C. Elwood, RD Desmond (eds), Dictionary of British and Irish Horticulturalists (CRC Press, 1994), p. 137. Betham 1/13, f 87, n 271, and 1/15, f 63, n 180. AP Burke (ed), Family Records (London, 1897), p. 280; Maxwell mss family tree, courtesy of Justin Power (25.9.2008). Parish reg, Saint Mary’s, 37/186; Parish Register, Saint Andrew’s Church, Westland Row, Dublin; AP Burke, Family Records (London, 1897), p. 28; Thom’s Directory (various eds., 1880s and 1890s); Maxwell mss family tree, courtesy of Justin Power (25.9.2008). AP Burke, p. 280; Thom’s Directory, various eds, 1907-1935. Death notice, The Irish Times, 17.7.2003 for K.G. Comerford-Green. Debrett’s, various eds, s.v. Companionage; death notice, The Irish Times, 17.7.2003. © Patrick Comerford, 2007, 2008, 2009, 2010, 2011, 2012, 2013, 2014, 2015, 2017. Last updated: 25 September 2008; 14 and 16 August 2009; 21 and 22 January 2010; 26 August 2010; 19 November 2010; 5 and 24 May 2011; 16 June 2011; 22 and 23 October 2011; 16 March 2012; 18 May 2012, 20 August 2012; 17 and 24 February 2013; 1 July 2013; 5 January 2014; 30 April 2014; 17, 18, 19 and 20 June 2014; 21 July 2014; 7 October 2014; 3 and 9 January 2015; 17 December 2015; 13, 22 and 23 May 2017. I am descended from Catherine Comerford who married James Nagle, their son Richard N of Garnavilla married Miss Manderville and had a son James Nagle of G. died 1782 who married Elinor Longe and had a son Richard who married Mary Anne O'Flaherty and had a daughter Catherine Nagle who married Richard FitzGerald and had amongst others a son Richard Albert FitzGerald who married Emilia Frizoni di Celerina and had amongst others a son Richard Edwin FitzGerald who married Lucie du Boistaille and had amongst others a son Raymond Joseph FitzGerald who married Elise Biard and had amongst other Maurice Joseph Edwin FitzGerald who had seven children, I am the fifth.